Your plumbing system is particularly vulnerable during the winter months. Certain measures should be put in place to ensure that your plumbing system remains operational in the winter, or you risk ending up with a burst pipe that could cause major water and structural damage – leading to inconvenient and expensive repairs. Below are two winter plumbing mistakes you should avoid so that your plumbing remains in good condition throughout the winter season. 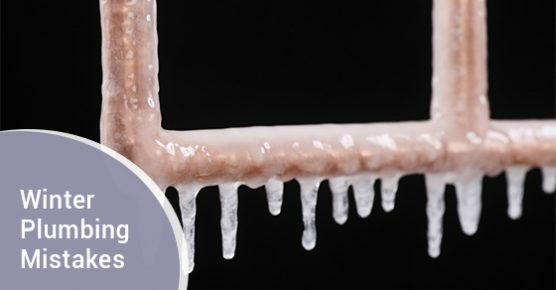 Whether you have plastic or copper pipes, they are at risk for freezing. There are a few different ways to prevent freezing pipes. The first is to insulate the pipes in your home that are in unheated areas, like the attic, crawl spaces, and basement. Heat tape can keep pipes from freezing. However, it is critical that you choose your tape wisely and read the manufacturer’s instructions carefully, because some tapes can overheat and pose a safety risk. Keep in mind that some tapes should not have insulation placed over them, as this creates a fire hazard. Your outdoor plumbing fixtures are also at risk of freezing. Therefore, it’s important to not forget to disconnect any outdoor hoses, to help prevent freezing in the pipelines. If possible, it’s also a good idea to use an indoor valve to turn off and drain the water from pipes that go to the outside faucets. Another mistake people make during the winter months is turning the thermostat down. This is often done out of habit. However, during the winter months, the thermostat should be kept the same both during the day and the night. The thermostat should never be set any lower than 55F (12C). During the winter season, people do a lot of cooking. The problem is that putting grease and other bits of food down the sink will eventually cause a clog. Never put grease down the sink. You can also use a sink catcher to catch deposits of food before they get washed down the sink. If you are in need of professional plumbing services, call Advanced Plumbing at 877-286-8044 or contact us online here. We’re the plumbing experts. Advanced Plumbing offers efficient plumbing services and solutions, up front pricing, and 99.9% customer satisfaction.